I am a big fan of Fooled by Randomness and The Black Swan. I however decided to give up on Taleb’s new book, Antifragile (which I borrowed from library) , after just 43rd page. It is likely I am not able to appreciate the dense matter the author presents in this book. It is also possible, the author may mention other factors like choosing easy over hard. Or that I am happy to give up because I only borrowed the book from the library and didn’t buy it (although I would do the same because the cost of book is sunk). It is also possible I was put-off by the offensive stance the author takes in defending his idea against the establishment and al those who according to him refuse to understand antifragile is the correct opposite of fragile (and ot robust). I cannot also rule out that the theory of antifragile is supported only by the every data that is used to develop it. But the real reason is what I read on page 43. Here are some snippets, my peeves with those and hence my decision to return the book. Where is the data? How can a statement like “they say” find its place in a book proposing a new theory? Isn’t there selection bias here? Isn’t it likely that very few move on to take Calculus 103 and hence are likely more interested in it? If I find these problems in subjects I remotely understand what if I do not find other such bigger problems in subject areas I do not understand? Hence my decision to punt on the book. Update 8/14/2011: I wrote this article more than a year ago. There is a book out on the very topic of Bayesian reasoning. Times published an article on the book. The article gives a very similar coin-toss problem. You can find the solution here. There is no Thomas Bayes in NNT’s story, he died in the 18th century. His methods, however, are very relevant here. Back to NNT’s question, which one of the two answers will you agree with? Dr. John answers 50% because that was the assumption and each toss is independent of the other. Fat Tony answers no more 1% and believes the coin must be loaded and it can’t be a fair game. Dr. John follows the science of marketing by numbers to the letter. He applies hypothesis testing, sampling and statistical significance all the time. But, he confuses assumptions with facts. When he starts with an assumption he refuses to look beyond the obvious and refine his knowledge with new data. He sticks to the prior knowledge as given and dismisses events stating otherwise. Fat Tony has no system. He shoots from the hip. He is the big picture visionary guy. He has been there, done that. He has no prior knowledge nor does he care about analyzing whether data fits theory. He is simply convinced that getting heads 99 times in a row means funny business. He believes plural of anecdotes is data, worse, irrefutable evidence. In this specific example, Fat Tony is most likely to be correct and he gets it right not because of his superior street skills, gut feel, “Blink” but because of how he always makes decisions. He is correct in questioning the assumption but his methods are not repeatable or teachable. There is a better way between the street smart, gut-feel ways of Fat Tony who goes by just what what he sees (and he has seen enough) and the rigid number crunching of Dr.John who believes that the assumption holds despite data. That’s the Bayesian way. That is the way to confidently pursue strategy in the presence of uncertainties! P(C) = 0.5 where C is for his confidence level in getting tail. The 99 heads we saw are the data D. Bayesian asks given the observed data D, how does my estimate change. That is he asks what is P(C|D)? P(D|C) is the the chance of getting 99 heads in a row given that coin was fair. That is (1/2) raised to the power of 99, a very low number. P(D|Not C) is 1- P(D|C) , i.e, you can get this data in every possible scenario except with a fair coin. P(D| Not C) is almost close to 1. Here is a simpler explanation, the coin can be fair in only one way but it can be unfair in any number of ways. Plugging in the numbers we compute P(C|D) to be close to 0 and hence the refined estimate of confidence. Hence his answer that says how confident he is about getting tails in the 100th toss. To reiterate unlike Fat Tony or Dr.John, Bayesian does not say what the chances are but how confident he is about the outcome. 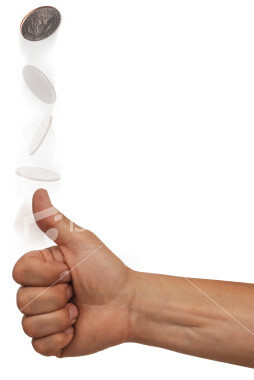 For those raising the valid point that the coin could still be fair if you continue to toss it for 10,000 or 10 million times. Yes, you are correct and Bayesian will continue to refine his uncertainty as new information comes in. He does not stop with initial information.